Welcome to my personal academic website. I am a faculty member at the Johns Hopkins Bloomberg School of Public Health, the department of Health Policy and Management. I have a joint appointment at the Johns Hopkins School of Medicine, the Division of Health Sciences Informatics. I am also the research director of the Johns Hopkins Center for Population Health IT (CPHIT), which focuses on advancing the use of IT in various areas of population health. Our research at CPHIT is often translated into pragmatic IT and analytic solutions that affect real-world population health management programs and risk stratification tools such as the Johns Hopkins ACG, which is widely used in the U.S. and around the world. Within the context of population health IT, my personal research focuses on the application of informatics solutions to advance the science of population health analytics. Some examples of my research include: evaluating the added-value of new sources of data (e.g., EHR data instead of claims) in population health analytics; assessing challenges of data quality on population health studies; and, utilizing health information exchange infrastructure to develop population health analytic platforms (e.g., linking new data sources/types, and centralizing risk stratification efforts). I have published over 60 peer-reviewed publications (journal and conference papers), authored multiple book chapters, and prepared a number of reports for the federal government. I serve on the editorial board of JAMIA Open and Population Health Management journals, and regularly review manuscripts for high-impact journals. The American Medical Informatics Association's symposium and Academy Health's annual research meeting are the typical venues that I present my research. Before joining Johns Hopkins, I was an acting faculty member at Indiana University (IUPUI campus) and closely collaborated with the Regenstrief Institute. My research at IUPUI focused on two domains: assessing consumer health informatics solutions, and utilizing health informatics exchange infrastructure for population-level decision support. As my research shifted to population health IT, I joined CPHIT to have a greater impact on the field. I have developed more than a dozen courses in health informatics. I was the Co-PI of an ONC award to develop a national curriculum for population health informatics and train more than 6000 healthcare professionals nationally. I have also been part of the NLM training programs, and have participated in curriculum development of two certificate programs (funded by ONC). I am currently the director of the DrPH Informatics track program at the Johns Hopkins School of Public Health, and the co-director of the PhD program in Health Informatics at the Johns Hopkins School of Medicine. You can find my CV, research interests, publications, teaching activities, and bibliometrics on this website. You can also find additional information on my JHSPH-HPM's web page as well as JHSoM-DHSI's website. Please email me if you need any additional information. Population health is a complex interdisciplinary domain. My current research focuses on the application and evaluation of informatics solutions within the context of population health. This emerging and rapidly growing domain of research and development is called "Population Health Informatics" (PHI). See this paper for additional information about PHI. 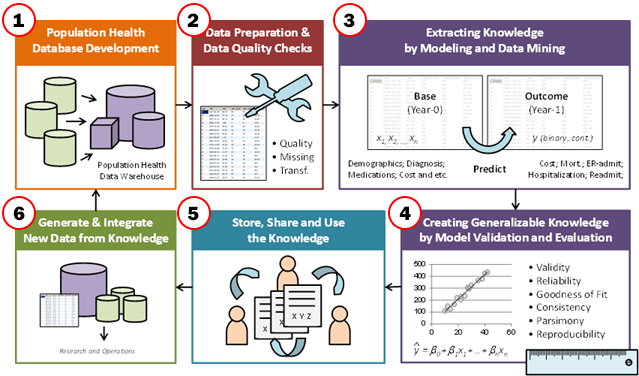 A key role of PHI is to improve the population health analytic cycle, which starts with data collection, followed by data preparation, data mining, model development & validation, knowledge sharing, and finally closing the loop by a learning health system that applies these models and feeds new data back in the loop (see diagram below). I am specifically interested to assess the opportunities and challenges of integrating non-traditional data sources (e.g. EHR data, social determinants of health data) to improve population health analytics (focusing on stage #1 to #4 of the diagram). Finding external data sources that can be merged with a given population-level data source is often a burdensome task. Systematically reviewing these data sources and developing "data catalogs" that can make them readily available to population health researchers is an approach to overcome this problem. Funded by AHRQ and NIH, we devised a framework on how to systematically review data sources (not publications), what data specs should be coded, and how the data should be presented. Our work was focused on data sources used in Obesity and Suicide Prevention studies. Population health analytic often deals with real-world data, thus data quality issues (e.g., completeness, accuracy, timeliness, provenance) can affect the results and their generalizability to various healthcare settings. In addition, data quality will be vital to the integrity of population health analytic in the near future as the field is moving toward using new sources of data (e.g., EHRs, HIEs) that have varied levels of quality. My work has focused on challenges in using EHR data for clinical phenotyping as well as using HIE data to predict hospital readmissions. My work on cleaning BMI data (e.g., weight and height) in large datasets, and assessing the reliability of geo-driven social determinants of health is currently underway. A major contribution of PHI to population health analytic is providing new methods to extract novel types of data from various data sources. For example, the free-text of EHR includes ample information about individual patients that can be used in risk stratification efforts; however, these extra information are often missing in encoded fields of EHRs. In a prior study we assessed the value of free-text in identifying geriatric syndromes (which are predictable for utilization). We also assessed how the physician's mention of frailty in the free-text is associated with this information. We are currently evaluating the added-value of free-text for social determinants of health. Perhaps the most vital impact of informatics in population health analytic is to assess the added-value of novel data sources/types in improving model performance. We have studied the value of EHR data (structured diagnostic and medication data) compared to insurance claims. This study became the foundation for EHR-derived risk stratification integration. We then studied the value of comparing EHR prescription data to claims' filling data to measure patient's adherence and using it as a predictor for utilization. Using the geriatric frailty data generated by previous studies (see #3), we assessed the value of such free-text-derived frailty markers in improving utilization prediction. And, we also evaluated the added-value of common laboratory results in improving risk stratification models. Our work on integrating vital signs (e.g., BMI and blood pressure) in our predictive models are in-press. We are planning to integrate social determinants of health and other novel data sources in the near future. PHI is often affected by health policy and organizational changes. Our prior research resulted in defining the PHI domain, and identifying the high priority R&D efforts. We also edited a special issue on PHI (and community health informatics) to expand the idea of PHI. Recently we have predicted the adoption of higher functions of EHRs among hospitals which will be key to deploying population health management solutions. Please see my CV for other ongoing or completed grants/projects that I was not the primary PI or Co-PI (i.e., served as one of the co-investigators). Led the design and development of Component #21 (Population Health Informatics) of ONC's national health IT curriculum. Developed the LearnHIT.com website to host the entire ONC curriculum in a usable format (300+ hrs of lecture).
' + auth + '. ' + title + '. ' + pub + imp + '. ' + year + '; ' + vol + issue + page + status + "